Are Charles' huge YPC numbers inflated by a handful of lucky long runs? Not really. Charles' career Success Rate (SR) is 45.1%, and in 2010 it's second in the league at 50.7%. He's succeeding behind an undistinguished KC offensive line. Running behind the same line in 2009, Larry Johnson's posted a 26.3% SR compared to Charles' 43.1%. This season, Thomas Jones had a 38.3% SR compared to Charles' 50.7%. And run SR is the stat most critical to a team's fortunes. One possible reason for his high per-carry stats is that Charles is used relatively sparingly. He averages under 10 carries per game for his career, and 13 carries per game this season. Peterson is certainly the better fantasy value, leading in TDs and total yards per season, but Charles may be the RB with the better real-world value. 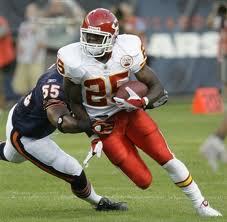 So Jamaal Charles got an extension. So what. He can afford it. Most guys I know would give up their left nut for an extension! Thank you. Thank you very much. I'm here all week! Come on, nothing about the Metrodome yet? Metrodome roof collapses due to snow. Witnesses say it went down faster than Favre's Wranglers on new intern day. Don't worry, Brian: I have a post from Gisele's combine workout for next week's post. We're in the 3rd quarter of the 1:00 P. M. games and still nothing on the metronome? Boy has this site slipped! Charles 417 for 2437 ; Peterson 1149 for 5613. When Charles attempts over 1000 rushes he will likely regress to the mean. When (if) Charles becomes the lead back like Peterson, and he is asked to carry the ball 20 times a game, I don't think he can keep up his 5.8 yards per carry. Case in point = Michael Turner. In his first 3 years of backing up LT in San Diego, his YPC was 5.2, 5.9, and 6.3. But when he became the lead back in Atlanta, his YPC dropped to 4.5, 4.9, and 4.3. I don't think it's fair to compare Charles to Peterson YET, because they have different roles. Peterson > Charles any day, until Charles can put up AP-like numbers as a #1 RB. Who's to say he should become like AP and carry the rock 20+ times a game? Maybe he is better used in his current role, his higher WPA/G and EPA/P reflect this. Can't keep up the average with 20+ carries? Here's his YPC in games with 20+ carries, starting last season: 7.1, 6.2, 4.3, 10.4, 8.0, 7.9, 5.5. This guy is going to be a legend. *Yes, I chose that threshold because Charles has carries of 190 and 192 in 2009 and 2010, respectively. It is absurd to give Thomas Jones as many touches as this guy.